With the cold, rain and blustery weather attacking the UK at present, why not warm your cockles this January with this soup-er recipe from Sweden, where they know a lot more about food perfect for dealing with arctic weather. Healthy, warming and finished off with Sweden’s King of Cheeses Västerbottensost which is now available in Waitrose priced at around £4.60 for 200g, this dish can’t fail to banish the January blues. Preheat the oven to 225°C/425°F/Gas 7. De-seed the peppers. Arrange peppers and whole garlic cloves on a baking tray. Drizzle a little oil over and roast in the oven approx. 20 minutes. Remove and allow to cool. Bring water and stock cube to the boil. Peel the peppers and garlic cloves and place in a food processor with stock and lemon juice. Blend to a smooth soup; if necessary, add more water to improve consistency. Season with salt and pepper. Crumble the bread and fry in a little oil in a frying pan on medium heat. Fry the king prawns in a hot frying pan approx. 1 minute and thread three onto each skewer. Mix cheese, bread croutons, grated lemon rind and parsley. Reheat the soup if necessary and pour into four bowls. 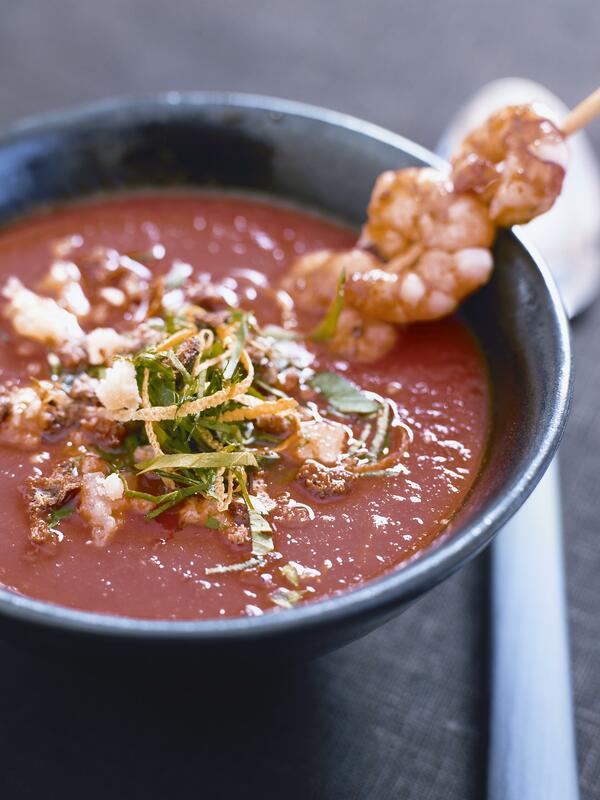 Serve with a king prawn skewer and the cheese mixture. Yum! Sounds fabulous, looking forward to trying this out! !